Orbital Sciences will build the rocket for Paul Allen's Stratolaunch project. 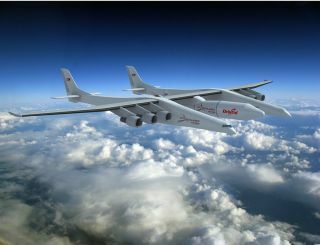 WASHINGTON — Stratolaunch Inc., the Huntsville, Ala., company created by Microsoft co-founder Paul Allen seeking to develop a low-cost satellite launching system, has given Orbital Sciences Corp. a contract to build the world's largest air-launched space rocket. In the process, Stratolaunch significantly scaled back the role of Huntsville-based Dynetics in the program. "Orbital will be providing that now, as it will be significantly descoped since they are going with solids" for the rocket, said David King, the former Marshall Space Flight Center director who is now executive vice president of Dynetics. King said Dynetics will still provide some technical and programmatic support for Stratolaunch. Orbital, builder and operator of the small Pegasus air-launched rocket, will be doing more than assembling the Stratolaunch rocket. According to a June 3 Stratolaunch press release, Orbital also is responsible for the "processes and procedures that will need to be in place to operate the system." Gary Wentz, Stratolaunch's chief executive officer, declined to specify the value of Orbital's contract when reached June 4 by email. Wentz did say that Orbital "would do everything through the demo launch, which is scheduled for 2018." Stratolaunch's press release said the Orbital-built rocket would be able to lift about 6,800 kilograms to low Earth orbit "and smaller payloads to geostationary transfer orbit," the drop-off point for most commercial telecommunications satellites. Wentz would not provide exact specifications for the Orbital-built rocket, except to say it will be a three-stage system. "We are still trading the specifics of the stages but the leading candidate uses liquid and solid stages," Wentz wrote. "We continue to maintain the requirement for a 5-meter fairing, which allows for maximum size payloads that can be accommodated on an EELV [Evolved Expendable Launch Vehicle] and sets a common diameter interface for a future capsule." EELV refers to a class of rockets used to launch the vast majority of U.S. government satellites. Stratolaunch plans to start out launching basic satellites but has not ruled out launching astronaut crews in the future. Orbital is managing the project within its Advanced Space Programs group rather than its Launch Vehicles group. Company spokesman Barron Beneski said that, for now, there are only "a couple of dozen people" working on the Stratolaunch rocket, all of whom are located at Orbital's Dulles headquarters. Dulles is the final assembly point for most of Orbital's satellites, and for the Cygnus cargo spacecraft the company is using to resupply the international space station. Most of Orbital's rocket-building work force is in Chandler, Ariz. Meanwhile, the first test flight of Stratolaunch's huge carrier aircraft — a twin-fuselage vehicle with a 117-meter wingspan being built by Scaled Composites of Mojave, Calif. — is on the slate for 2016. The carrier plane would be capable of flying 2,400 kilometers from a launch site before deploying its rocket. Stratolaunch is not Paul Allen's first space project. The billionaire investor also bankrolled the hybrid rocket-powered SpaceShipOne that in 2004 claimed the $10 million Ansari X Prize by staging two flights to an altitude of 100 kilometers within two-weeks.